The Beautiful Dayflower . . .
“Wildflowers of the West Village” has so far documented and profiled over a dozen species of native and immigrant wildflowers. Some have stood out, literally, because of their size (the Common Mullein) or because of their sheer number and distribution (the Dandelion). One question I have yet to fully investigate involves the subjective area of beauty. Many of the wildflowers found in the West Village resemble variations of the common daisy: white petals, yellow center; or else are completely yellow, like the Wood Sorrel; or simply green, like Lamb’s Quarters and the Common Plantain. Enter the Asiatic Dayflower, Commelina communis. Known as “bluebells” to some (though not to be confused with the true Common Bluebell, the springtime perennial Hyacinthoides non-scripta), the Asiatic Dayflower is an herbaceous annual that blooms into its own by late June and lasts on until the middle of the autumn season. The name indicates correctly that the plant is an immigrant from East Asia, where it is found in both China and Japan. I studied the Japanese language during my undergraduate years, and that culture’s name for the plant is tsuyukusa – “dew herb” – which to me poetically describes this plant in its best light. The dew herb prefers moist soil and damp, shaded areas. Groups of the plant will be often found clustered in side street tree pits and in the little gardens situated beside stoops. The thick green foliage will grow up to about knee high and then suddenly present blue blooms along a red brick wall or within and without the length of a black wrought iron fence. The deep green lanceolate leaves do not possess a leaf stalk, yet nonetheless resemble a miniature corn plant. Leaves are supported by decumbent stems that also carry the blooms on inflorescences located near the tip. 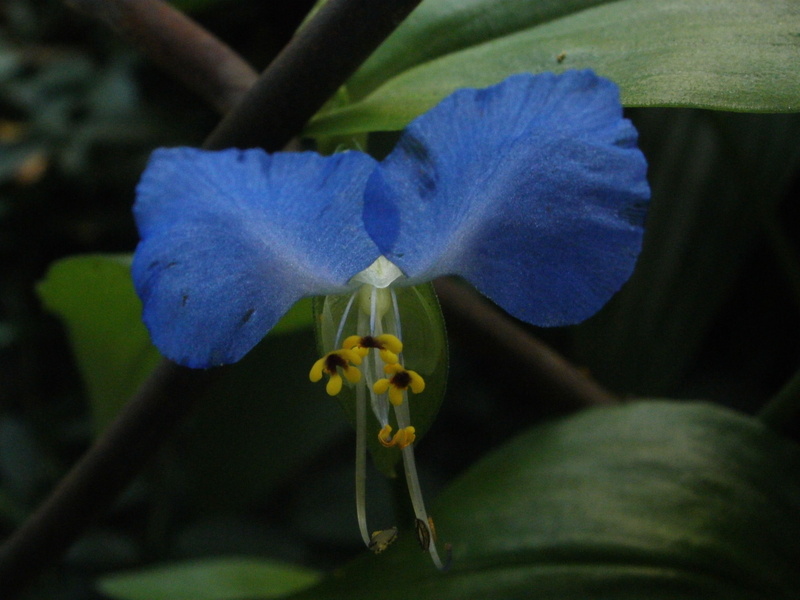 An individual Asiatic Dayflower is a thing of beauty and resembles a plant’s colorful reinterpretation of a mouse’s face: the shape and position of the two large blue petals bring to mind the ears; the six stamens, the whiskers; and the third, white petal beneath forms the pointed little mouth. Each bloom holds six yellow stamens, which are an interesting study. These can be divided into two sets of three: the top, or posticous, are infertile; the bottom, or anticous, are fertile. This naturally occurring example of numerical symmetry and balance of opposites leads one to make a connection between the plant’s Asian roots and the philosophical tenets of that region’s primary philosophical model, Buddhism. The Asiatic Dayflower has uses beyond inspiration for philosophical contemplation. The flowers have been used in Japan for pigment and a specific dye called aigami, a particular shade of blue that was an essential aesthetic component to Japanese woodcuts of the Ukiyo-e era of the 18th and 19th centuries. Chinese medicine has brewed the leaves into a tea that relieves sore throats. A new environmental application has been suggested because of the specie’s ability to accumulate metals. A pioneer ruderal already, the plant might in the future be planted purposely around abandoned mines as a way to soak up excess heavy metals from the surrounding soil. 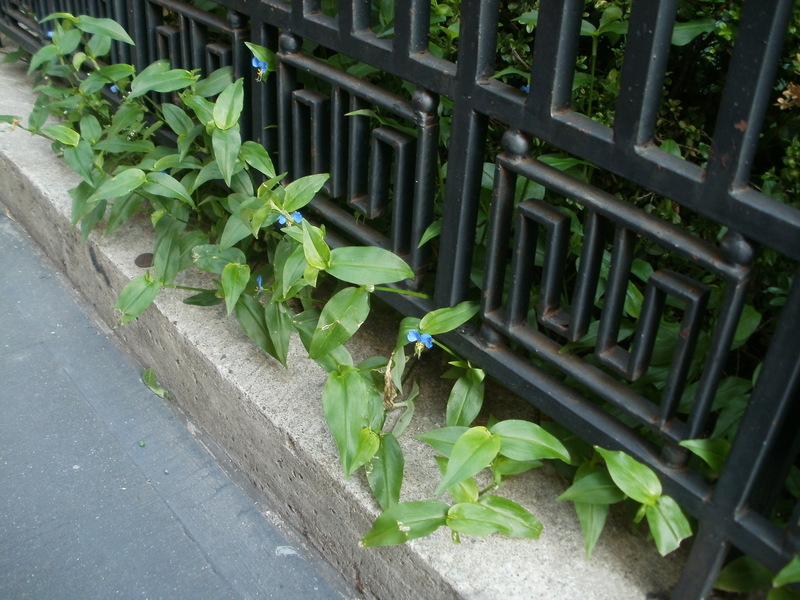 I would add here that the Asiatic Dayflower’s proclivity for edges would make it a fine domesticated ornamental border in small gardens. The plant already gives life and beauty to West Village spots neglected either because of nearby construction or rentals occupied by folks too preoccupied to tend their tree pit. 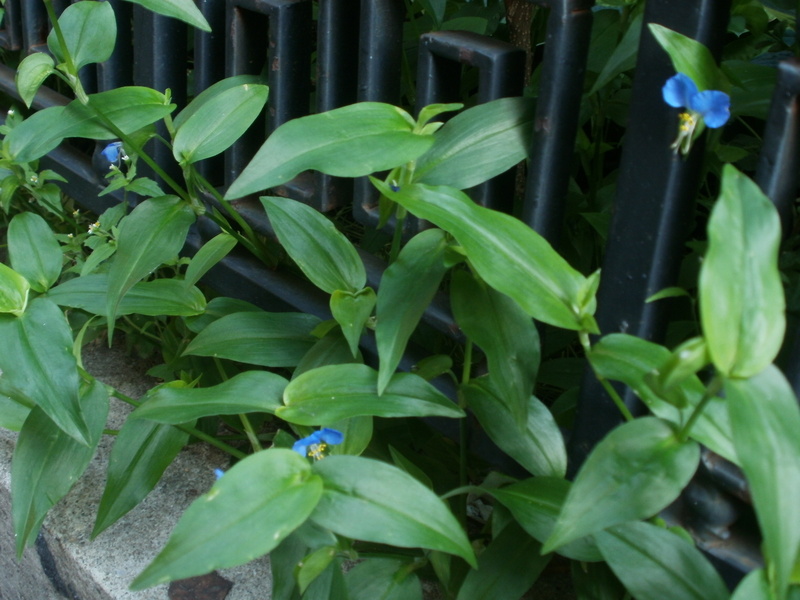 With so many historical and practical uses, and because of its distinctive, deep blue bloom, the Asiatic Dayflower is my selection as the “most beautiful” Wildflower of the West Village.